Document No 74: "A Salute To Victory. "Puritan", the successsful defender of the 1885 America's Cup, sails up the East River, New York." 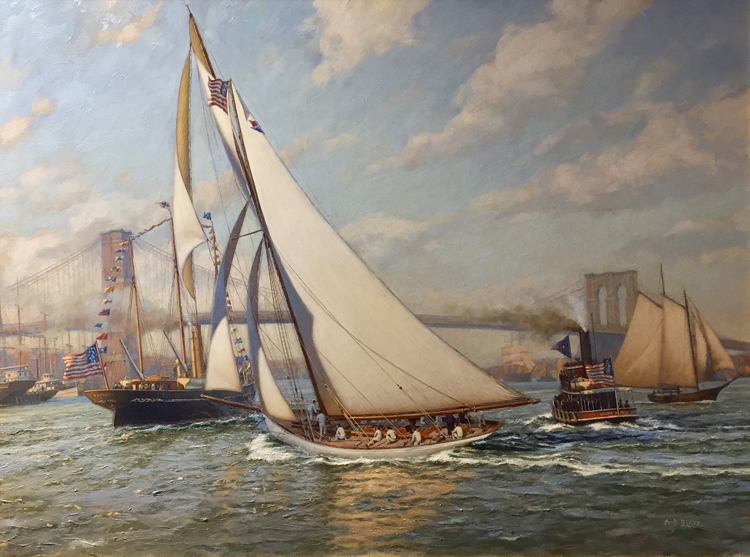 "Puritan", having just defeated "Genesta" in the America's Cup match of 1885, is shown sailing up the East River, New York, in the late afternoon in the company of the steam yacht "Namouna" and the tug, "Wilma D.", chartered by the New York Yacht Club. "Namouna", owned by the Commodore of The New York Yacht Club, James Gordon Bennett Jr., is dressed in flags to celebrate "Puritan's" victory. "Puritan's" crew are preparing to tack, after passing close astern of "Namouna". The "Wilma D." has turned to starboard to allow both "Namouna" and "Puritan" to turn. The Brooklyn Bridge can be seen in the near background. A schooner is sailing past, outward bound and a 'square rigger' can be seen being towed under the bridge by a tug. "Puritan" was built for a syndicate of Bostonians including both Eastern and New York Yacht Club members. She was designed by Edward Burgess and was his first design for the America's Cup. "Puritan" was 94 ft. LOA and 81ft. LWL.